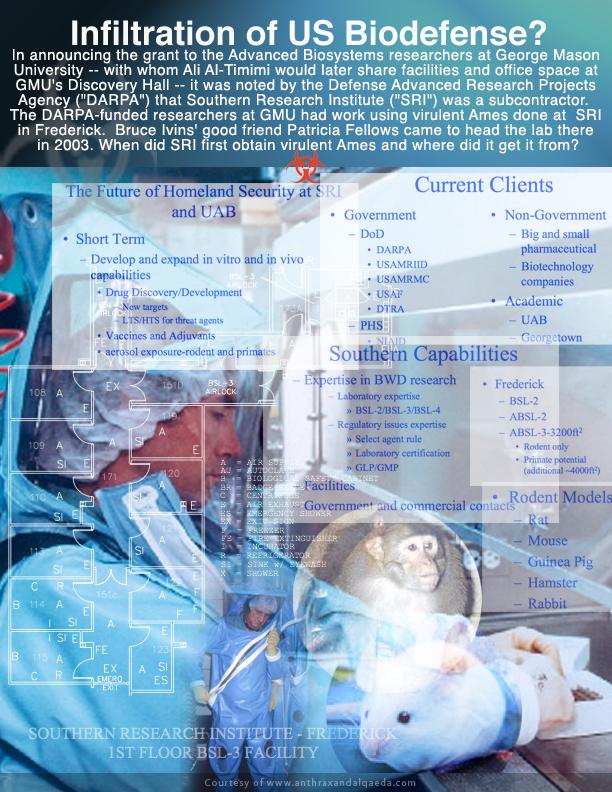 * Anonymous states … This DARPA budget document shows that DoD was experimenting with microencapsulated pathogens in 2000-2001 … Bruce Ivins could not have produced such a dry anthrax powder that was microencapsulated « CASE CLOSED … what really happened in the 2001 anthrax attacks? « * Terry Abshire in a document produced this week under FOIA explains that the genetically matching sample she had in her lab was not submitted in the initial set ; instead, wasn’t her lab provided genetically matching material in August 2000 for DARPA research in which Dr. Ezzell made a dried powder out of the Ames and gave it to the DARPA researchers? Evaluated the feasibility of additional strategies (e.g., exhaled breath) for direct identification or detection of infection without direct sample collection. Demonstrated the ability to perform accelerated patient diagnosis using a rapid single molecule DNA sequencing technique in a model system. Completed development and testing of first-generation prototype biochip sensor. Continued the development of effective and rapid chip-reading capability with enhanced sensitivity and low false alarm rate. Continued the development of advanced alternative technologies for live vs. dead bio-agent identification using peptides and other molecules. Designed and tested techniques to replace antibody-based detection, such as short peptides, aptamers and lectins. Designed and tested novel reporting/transduction techniques such as ion channels. Designed and synthesized short peptide binding molecules for use in the detection of biological warfare agents. Evaluated ion channel sensor systems for use in the detection of biological warfare agents. Evaluated methods for removing micro-encapsulation of disguised pathogens and/or sensing through the micro-encapsulation. Developed technologies required for next-generation miniature biological detectors including the use of microelectromechanical systems (MEMS), microfluidics, and mesoscopic -sized components. Evaluated false positive and false negative rates for systems of detectors using biomolecular cells or tissues. Exploited and/or mimicked the olfactory sensors of biological systems for use in the detection of biological warfare agents. Demonstrated enhanced signal output from engineered cells and tissue based sensors and integrated information from these sensors with user interfaces for predictive responses. Engineered a deployable prototype cell and tissue sensor for field-testing. Evaluated sample collection technologies for cell and tissue sensors. Evaluated methods of cell stabilization for possible application to cell based sensors. Developed biosensor models and robust characterization protocols. Evaluated new resonant modes for biosensors. Investigated standoff techniques for trigger and identification. The chemical analysis of the attack spores suggests that microencapsulation with a tin catalyzed silicone polymer was employed. Something that was not possible at Fort Detrick. Bruce Ivins could not have produced such a dry anthrax powder that was microencapsulated. This entry was posted on October 7, 2011 at 1:16 pm	and is filed under Uncategorized. Tagged: *** 2001 anthrax attacks, *** Amerithrax, *** Dr. Bruce Ivins, *** FBI anthrax investigation, Biological Warfare Defense, Department of Defense FY 2003 Budget Estimate, microencapsulated pathogens. You can follow any responses to this entry through the RSS 2.0 feed. You can skip to the end and leave a response. Pinging is currently not allowed. Was Flask 1030 (Notebook 3655) the source of the Fall 2001 anthrax mailings rather than Flask 1029 (Notebook 4010)? I am sorry to inform that his wife writes me to say a good friend of mine and the blog, Stuart Jacobsen, has passed away suddenly, of a heart attack. He was found slumped over at his desk. He was only 56 years old He will be sorely missed. The FBI’s and Army’s delay in processing FOIA requests — and not expediting them on this subject — is inexcusable. One of the notebook that the Army is withholding relates to microencapsulation — so this is horrible timing. The notebook relates to Flask 1030, which relates to the genetically matching Ames that contained a silicon signal — unlike Ivins Flask 1029 so-called “murder weapon” (which did not have such a silicon signature). 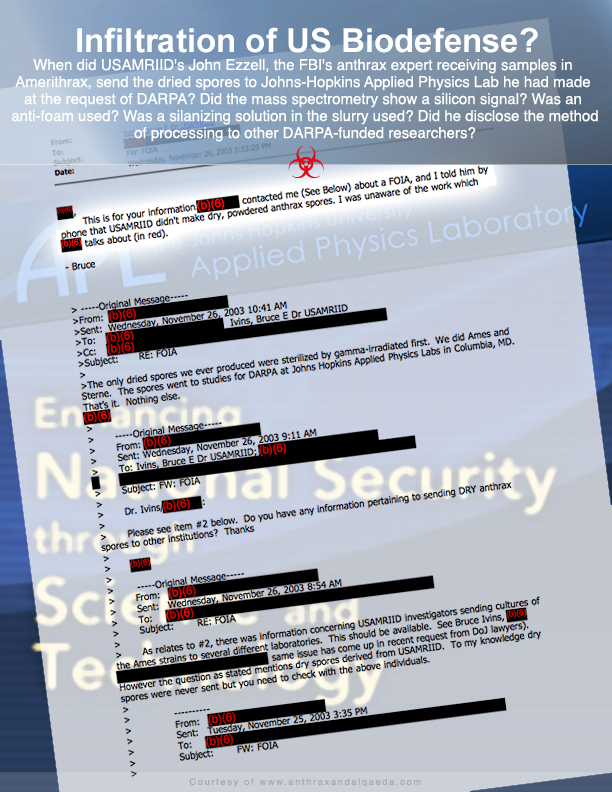 Stuart used to work for DARPA in a field related to floatability and silica. His source of information on these issues of Amerithrax was a senior DARPA Program Manager who went on to even far more distinguished positions. 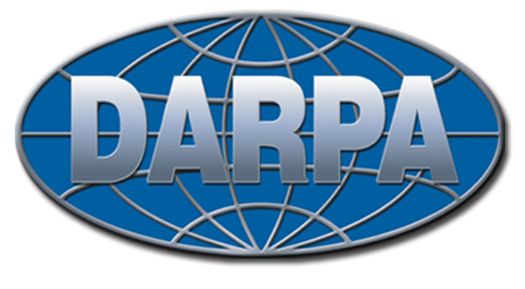 Stuart was told in Fall 2001 by the former DARPA Program Manager that they even know the machine that was used. I’m in the business of representing whisteblowers. The Silicon Layer Supports Acid Resistance of Bacillus cereus Spores. Given the Spring 2001 patent of Ali Al-Timimi’s suitemates involved growing anthrax in a culture medium containing added silica, the forensic evidence is strongly exculpatory of Dr. Ivins but points to the importance of greater disclosure regarding Ali Al-Timimi’s coordination with 911 imam Anwar Awlaki. Building 1412 , Rm. 212 was where the FBI’s expert made a dried powder out of Ames supplied from RMR 1029 as part of a DARPA-funded program. No sample was submitted initially to the repository and it was later seized. JE’s assistant then went on to Johns-Hopkins. The Ames seized from Building 1412, Rm. 212 had 3 mutations. USAMRIID’s John Ezzell, the FBI’s anthrax expert, prior to 9/11, made a dried aerosol using Ames supplied by Bruce Ivins and sent to Johns-Hopkins Applied Physics. when did Southern Research Institute first obtain virulent Ames and from whom? the research on the corona plasma discharge and sonicator on Ames spores supplied by Bruce Ivins was conducted for DARPA. where else the DARPA aerosol studies using dried powder were done. Given the performance of the dried aerosol, the technical question of whether the floatability is due to use of a CPD or sonicator should be addressed by the scientific experts. Dr. Ivins expressed concern to a superior that he was missing samples — only to be told to shut up. Alternatively, the GAO should cite the title of the article and where it appeared in its report. William Broad and Scott Shane’s article on this subject will appear later in the day. Let’s see if they rely on scientists who have made anthrax simulant using a silanizing solution — scientists who have made microencapsulated product. Let’s see if they took the rudimentary step of obtaining a copy of the 2004 article that Dr. Ivins supplied the FBI on the subject. The link you found on microencapsulation is very interesting. What we need is some major news organization to move the ball down the field with interviews of people with expertise who can shed further light on the Silicon Signature and its potential probativeness. I have suggested as a qualified expert John Kiel, whose air force lab helpfully did controlled experiments on the Silicon Signature. (He found a silanizing solution in the slurry led to the same SEMs as the mailed anthrax; it did not relate to “floatability” as such but made the anthrax more lethal). Additional government experts include Lawrence Livermore’s Velsko or Weber, the government consultants who have urged the importance of understanding the reason for the Silicon Signature. Or Dr. DeBell the Battelle aerosol consultant in 2001 from Virginia is an authoritative expert as to know-how. Dr. Franz could also say when SRI first acquired virulent Ames but dropped contact with me when I asked. Michael Osterholm (UMN) and his NYT correspondent co-author John Schwartz could give the background of what they know about microencapsulation and its purposes dating to their work on their 2000 book which Dr. Ayman eagerly read (judging from the documents seized in Afghanistan). Public understanding of such an issue — which FBI scientist Chris Hassell would be correct to point out has national security implications — need not be any more detailed than already made plain in the 2000 book by Dr. Osterholm and his NYT journalist co-author John Schwartz. see index for word “microencapsulation” and go to explanation that it serves to protect the anthrax from being killed by heat and sunlight. Thus, for AQ to say “we have this anthrax” is very bad news. For the case of biological agents, there is also the possibility of weaponization — engineering of the organism to improve its stability or other properties. In general, weaponization begins with the growth of the agent (lag, log, and stationary phases each have unique properties mixed in with the culture media), then fermentation; centrifuging and separation; drying; milling for respirable particle size; additives to prevent aggregation and clumping, neutralize electrical charge, and increase survival in air; and microencapsulation for stability and viability. bottom of PAGE 189 … Microencapsulation is not a new technology. Between the late 1940s and early 1960s, the concept of chemical microencapsulation generated interest in the pharmaceutical industry as an alternative mode of drug delivery that could offer sustained controlled release. Researchers … entrepreneurs continue to utilize and investigate advances in microencapsulation technology in efforts to make dosages more palatable, make active ingredients more stable and/or soluble, and otherwise improve drug delivery. I may be misremembering which of the books Dr. Ayman was interested in reading discussed microencapsulation. As I’ve been explaining for years now, Kathryn Crockett, Ken Alibek’s assistant — just a couple doors down from Ali Al-Timimi — addressed the microencapsulation in her 2006 thesis, “A historical analysis of Bacillus anthracis as a biological weapon and its application to the development of nonproliferation and defense strategies.” She expressed her special thanks to bioweaponeering experts Dr. Ken Alibek and Dr. Bill Patrick. Dr. Patrick consulted with the FBI. Dr. Crockett successfully defended the thesis before a panel that included USAMRIID head and Ames strain researcher Charles Bailey, Ali Al-Timimi’s other Department colleague. In 2001 he said he did not want to discuss silica because he did not want to give terrorists any ideas. Oops! Too late. The scientist coordinating with the 911 imam and Bin Laden’s Sheik was 15 feet away. When Plague Wars was first published in September 2000, Rauf Ahmad, Ayman Zawahiri’s scientist was attending the conference in the UK with Bruce Ivins and other USAMRIID and Porton Down scientists. (Dr. Ivins had been working to plan the June 2001 conference for over two-and-a-half years, since coming back from the September 1998 conference). A starting point of analysis is: Rauf Ahmad says he consulted with someone about processing tricks. Who did he consult? See uploaded correspondence mentioning the processing tricks he had learned from someone. Rauf Ahmad knew a lot about seeds, foodstuffs, bacteria and the like. But he was not the only expert who supported the Salafist-Jihadis. Some were even highly expert — cutting-edge — on microencapsulation to include Magdy Al-Nashar who had the keys to the apartment used by the 7/7 bombers. Consideration of the “silicon signature” got derailed when there was a focus on the issue of floatability (“hang-time”) — when the dual purpose process of micro-encapsulation is also part of “weaponization”. Viability, lethality in the lungs, acid resistance, resistance to ultra violet light, ease of manufacture are examples of other considerations that bioweaponeers consider. That is why it is important to seek out the opinion of experts who have been involved in making aerosols using anthrax simulants. Magdy Al-Nashar is but one example of an expert on functional polymerization. Rather than having no access to virulent anthrax or know-how, the difficulty of the investigation by the Third Squad — if they had not proven themselves Keystone Kops by settling on an Ivins Theory — has been that there are so many vexing possibilities that needed to be run down, both here in the United States and abroad. As Ken Kohl explained years ago, he only wishes the public could understand how much work has gone into running down the full range of possibilities. We can fully credit the good faith of investigators and prosecutors while noting that what has been disclosed about an Ivins Theory is not at all persuasive — and urging that the effects of any compartmentalization among governmental employees be overcome and the DOJ come into compliance with FOIA. While some have suggested spuriously that others could be confidently excluded, let’s take a single example, if Dr. Majidi does not know the whereabouts of Jdey, how could he be excluded? Once the FBI assumed the processor would be the same as the mailer, a botched result was inevitable — especially once the CYA motivation upon Ivins’ death kicked into high gear. I’m not a scientist but I believe this new study out of Tehran is discussing the event of UVB (which I believe is what we think of as the tanning sun ray) on anthrax. While I don’t know anything about science, I have a sense of Dr. Ayman as a strategist. And he is someone who will seek to finish what he set out to do. He has been reading on the effects of sunlight on anthrax since 1998. And his intentions were made plain in the spring of 1999. Shehata and his family were living in a suburb of Tehran. Shehats’s importance in anthrax planning should not be underestimated given he was in touch with his brother-in-law Jaballah and Mabruk, who announced Dr. Ayman’s intentions regarding anthrax. An in vitro Survey on the Apoptotic Effects of UVB Ray in Bacillus anthracis. MSc, Microbiology Department, Faculty of Basic Sciences, Islamic Azad University, Shahr-e-Qods Branch, Tehran – Iran. Objectives: Bacillus anthracis as the bacterial agent of anthrax, is spread in different geographical zones around the world.The purpose of this survey was to observe eventual apoptotic reactions in total genomic DNA of UVB irradiated colonies of Bacillus anthracis.Materials and Methods: The colonies of Bacillus anthracis were exposed to UVB ray for 10 minutes; then, the DNA molecules of control and irradiated colonies were extracted. Finally, the DNA samples mixed in loading dye, were run in 1% agarose gel containing fluorescent dye of ethidium bromide to produce visible DNA bands.Outcomes: Neither smear nor DNA laddering band were detected upon the agarose gel.Conclusions: According to the present protocol, the UVB ray can not induce apoptosis feature in colonies of Bacillus anthracis. It seems that the recovery and protection systems in Bacillus anthracis can resist against eventual UVB disorders. Besides, as we know the long-term and high dosage of UVB, has harmful effects on human’s skin (8). 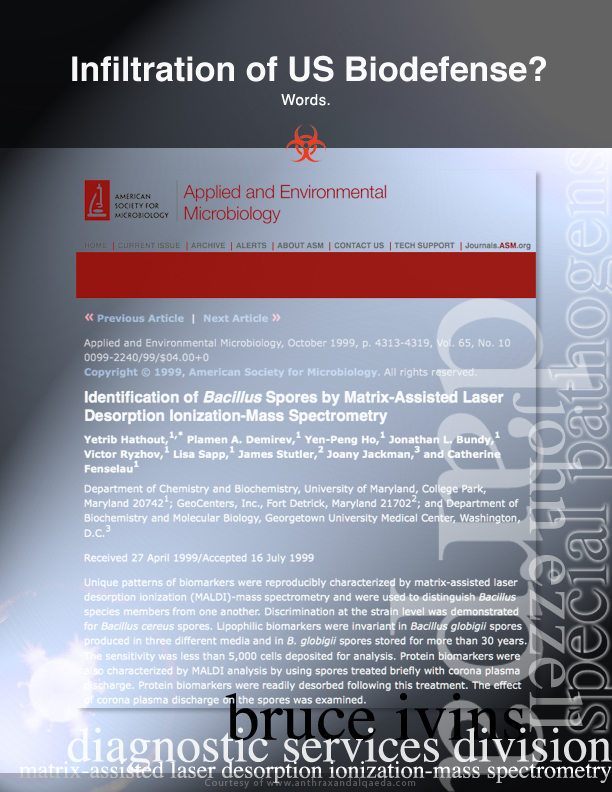 Nevertheless, according to the present UV-irradiation protocol, if we could induce the apoptosis feature in Bacillus anthracis, we should continue the present study as in vivo experimental investigation; because, the final goal of these types of studies is to find cheap and safe methods for shortening the antibiotic therapies of microbial infectious diseases.